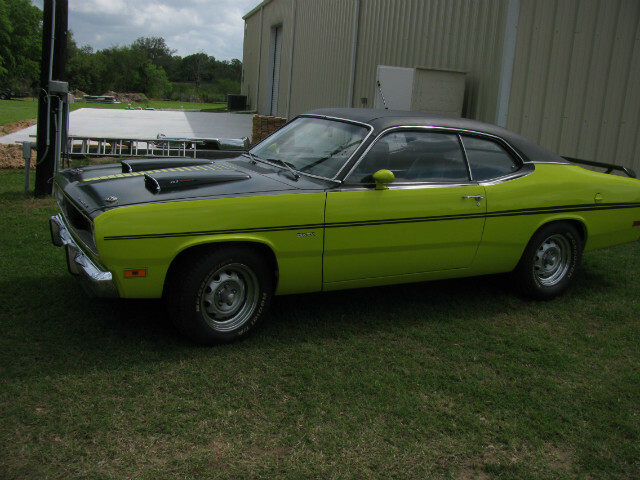 1970 360 duster, awesome little car, MOPAR W-2 heads, roller rockers/cam, dual hood scoops, functional. Mint rallye dash / gauges, 150 speedo/tach, buckets, NEW 15" rallye wheels, 275-60-15 rear, lots of upgrades. 4-speed manual, power steering, power disc brakes, rear wing, black stripes, curious yellow. solid, no rust. fast little car. Just installed new A body 8 3/4 rear housing with new brakes and new 3:73 sure grip, new hemi springs, lots more.